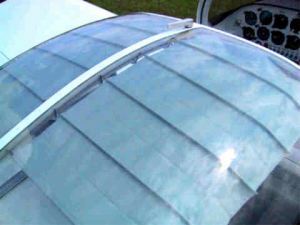 If you have spent any time in a canopy plane, you know what I am talking about. The major head backing , greenhouse action that goes on with that giant piece of plexi glass over your head. A simple solution by Kroger. (read Sam's review of this item for details. , buy it here) Is it cheap? No. $168.00. Easy to install? Yes, Michelle did this with very little input from me. Actually I only supervised cause I don't like drill bits near my canopy w/o my CLOSE supervision. A retractable little unit, like a small curtain over your head.